Xining (pronounced Shining) is a modern Chinese city with wide streets, many people and congested traffic. It is the political, economic, and cultural center of Qinghai (pronounced Shanghai) Province with an average altitude of 7217 feet. Human activity in the region can be traced to 2,100 years ago.It is sometimes called the "Summer Resort Capital of China" because of it's cool summers. There are about 37 nationalities living here. Many Chinese people are now purchasing their first automobile. Perhaps this is the reason we often feel crossing streets can be life threatening! 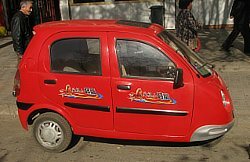 There are many vehicles like this little red car (or is it a motorcycle). Actually, we have seen these vehicles in a "car form" with a steering wheel and also in the "motorcycle form" with a handlebar. There are an abundance of new car dealerships up and down the street in our area. They have an annoying practice of setting off a string of firecrackers when they sell a new vehicle. Because of the various ethnic people groups in the area and the abundance of vegetables and meats, there is a large selection of good food. 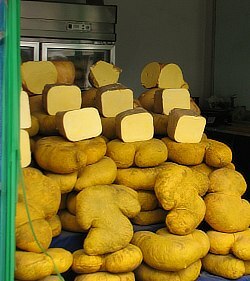 Here is a shop selling Yak butter. 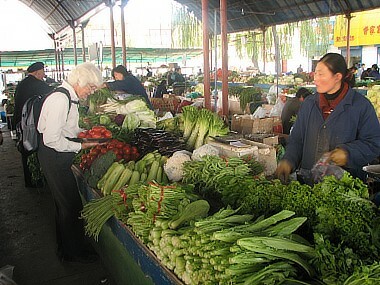 Twyla can find plenty of fresh vegetables, meat, and other foods just across the street from our apartment. The selection is good and the prices are extremely reasonable. One thing we cannot figure out is how they keep the vegetables from freezing when the temperatures drop to 0 degrees F.
A sight such as this is common on a Saturday afternoon. 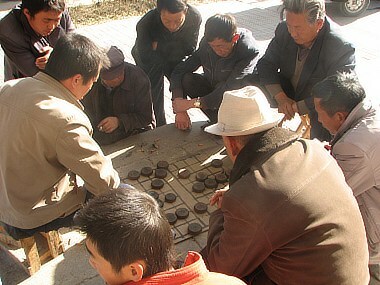 While the men are playing a form of checkers, the women gather around with knitting or just visiting. 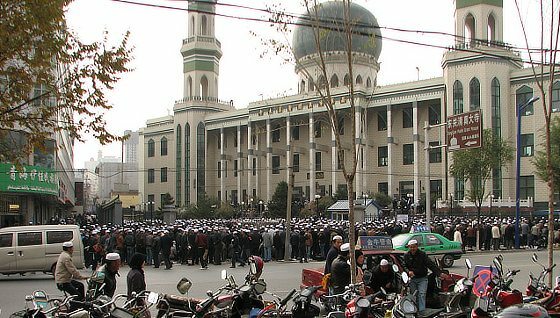 Not far up the street is the Qinghai University for Nationalities. This is a wonderful place for minority people to broaden their education. 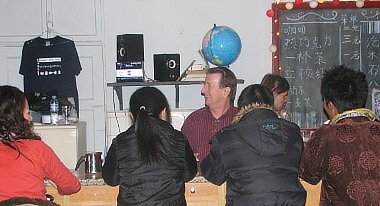 Some foreigners set up a "cafe" that is open two nights every week for local students to come and practice English. We also find it a good place for us to learn a little about the culture of the local people groups. 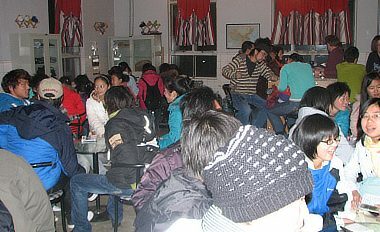 Typically ~60 students and 10 foreigners meet for 2 and 1/2 hrs. The first night we were there, all 8 students at my table were Amdo Tibetan. We met Michael at the Sweet Dew the first night we were there. He is Amdo Tibetan, comes from a farm on the way to Zeku and has 4 siblings (uncommon for China). 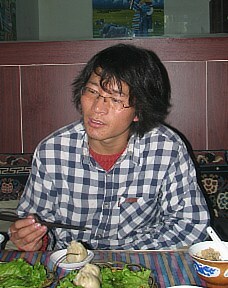 He was willing to guide us to a Tibetan restaurant downtown where this picture was taken. He has been at the Sweet Dew every time we have been there. We hope to see much more of Michael. The Sweet Due staff organized a special Christmas celebration on 23-Dec. 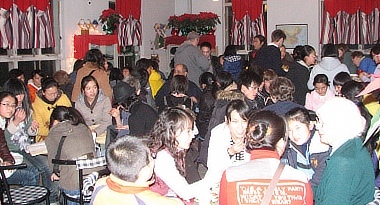 The place was packed, all food was on the house, many Christmas carols were sung in English, Tibetan, and Chinese. A special Christmas drama was presented. The picture at the top of this page. Please take a good look at the picture at the top of this page. It is a common sight where I teach some technical stuff for another foreigner. Why are there so many people on the outside of the building? Click on each of the answers below to learn the answer. 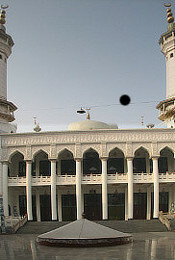 There is no more room on the inside of the Mosque! 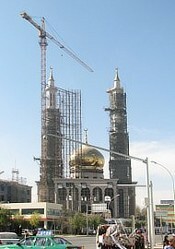 The two new Mosques in town are not finished yet! Actually all three answers are correct!